A MACKAY man facing serious animal cruelty charges over a horrific dog bashing has been temporarily banned from having any animal while the case is before the courts. Andrew Coleman has been revealed as the man allegedly behind the disturbing incident on February 13 this year, which was captured on camera. CCTV footage allegedly shows Mr Coleman holding down and brutally punching the bull Arab named Jaboo numerous times on Green St about 4.40pm. 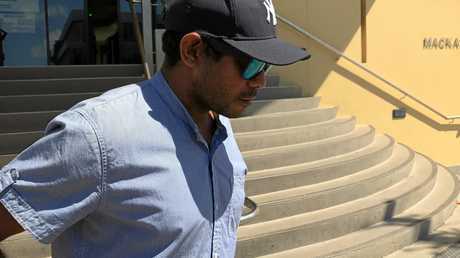 Animal cruelty accused Andrew Coleman leaves court: Mackay man Andrew Coleman leaves the Mackay Courthouse. He faced court on charges relating to a video which shows him allegedly beating a dog. 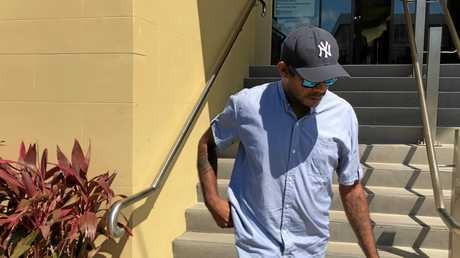 It is understood the dog belongs to Mr Coleman, who appeared in Mackay Magistrates Court for the first time this morning. Magistrate Ron Muirhead formally charged the 30-year-old with cruelty to an animal by causing it unnecessary or unreasonable pain. Barrister Scott McLennan, for the RSPCA, asked for an adjournment until next month and handed up a temporary prohibition order against Mr Coleman possessing, purchasing or acquiring any animal until the case was finalised. The court heard if Mr Coleman breached the order he could be charged and face fines up to $40,000 or 12 months' jail. Barrister Phil Moore, acting for Mr Coleman, said the order was consented to without prejudice against his client. The case was adjourned to April 16 and Mr Coleman must appear in person. When the distressing footage of the animal attack was released, the RSPCA slammed the incident as "disturbing". And social media went into overdrive with people expressing their disgust at the cruel act.